I’m just here living the dream. Waiting for my BFF to find relief of her back pain so we can get back in the kitchen together, and enjoying my Fall weather which finally returned. The cooler weather is always a welcome change in the fall. It brings back happy memories. And makes me think of college football oddly enough. I’m not a huge die hard football fan but I do love my Michigan Wolverines and coach Harbaugh is having a great season so far! I know that some of you are always looking for some great tailgate treats so here’s a quick and easy recipe that’ll really hit the spot this fall. In a medium mixing bowl add cream cheese, dill seasoning, salt, pepper, and mozzarella cheese. Mix together thoroughly and set aside. Roll out crescent dough and press seams together making a solid sheet of dough. 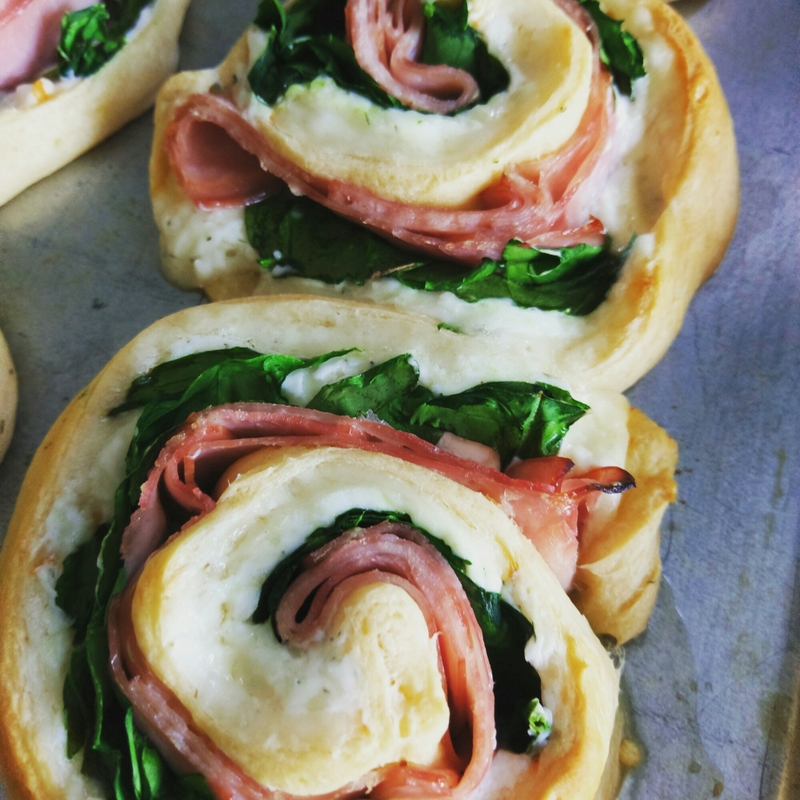 Spread cream cheese mixture over the dough and then add ham, spinach, and cheese slices. Roll dough length wise like a jelly roll and slice into pinwheels. Place on an increased baking sheet and bake at 350F for 12-15 minutes or until dough is golden brown. Serve warm. Happy cooking! Next Entry It’s late…but look at this!